QCRI Web Page is renewaled. Click here if not jump to the new page automatically within 5 seconds. 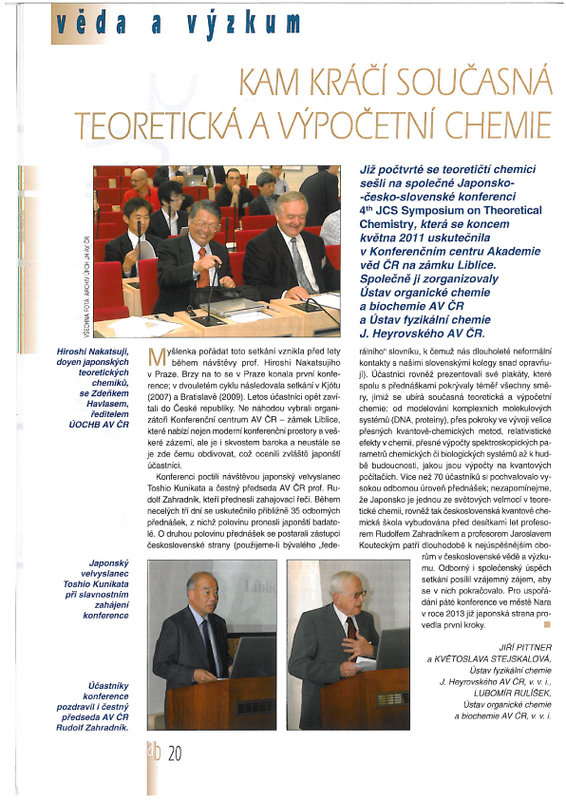 about JCS Symposium on Theoretical Chemistry Prof. Havlas and Prof. Nakatsuji initiated the JCS symposium based on the high-level scientific relationship and warm friendship among Japanese, Czech and Slovak theoretical chemists. Three previous symposium were held at Praha in Czech Republic (2005), Kyoto in Japan (2007) and Bratislava in Slovakia (2009). "Developing novel quantum theory and concept in chemistry and physics" is the theme of our institute. We aim to figure out universal principles in chemistry and physics and therby to predict new phenomena by applying these principles. Our dream can be briefly expressed as "Proposing Highly-Original Theory in Chemistry". We are realizing this dream through the active discussions in the laboratory. Copyright (c) QCRI, All Rights Reserved.